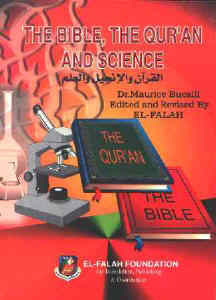 As in the case of the subjects already examined, the verses of the Qur'an dealing with the Earth are dispersed throughout the Book. It is difficult to classify them, and the scheme adopted here is a personal one. To explain them more clearly, one might begin by singling out a certain number of verses that deal with more than one subject at a time. These verses are largely general in their application and constitute an invitation extended to men to reflect on divine Beneficence by pondering on the examples provided. --the water cycle and the seas. Although these verses provide arguments intended to lead man to meditate on the Beneficence of God towards His creatures, here and there they contain statements that are interesting from the point of view of modern science. They are perhaps especially revealing by virtue of the fact that they do not express the varied beliefs concerning natural phenomena that were current at the time of the Qur'anic Revelation. These beliefs were later to be shown by scientific knowledge to be mistaken. On the one hand, these verses express simple ideas readily understood by to those people to whom, for geographical reasons, the Qur'an was first directed: the inhabitants of Makka and Madina, the Bedouins of the Arabian Peninsula. On the other hand, they contain reflections of a general nature from which a more cultivated public of any time and place may learn something instructive, once it starts to think about them: this is a mark of the Qur'an's universality. "(God) is the One who made the earth a couch for you and the heavens an edifice, and sent down water from the sky. He brought forth therewith fruits for your sustenance. Do not join equals with God when you know." Here are Signs for people who are wise." "(God) is the One who spread out the earth and set therein mountains standing firm and rivers. For every fruit He placed two of a pair. He covers the day with the night. Verily in this there are Signs for people who reflect." "The earth, We spread it out and set thereon mountains standing firm. We caused all kind of things to grow therein in due balance. Therein W e have provided you and those you do not supply with means of subsistence and there is not a thing but its stores are with Us. We do not send it down save in appointed measure." "(God is) the One Who has made for you the earth like a cradle and inserted roads into it for you. He sent water down from the sky and thereby We brought forth pairs of plants, each separate from the other. Eat! Pasture your cattle ! Verily in this are Signs for people endued with intelligence." "He Who made the earth an abode and set rivers in its interstices and mountains standing firm. He placed a barrier between the two seas. Is there any divinity besides God? Nay, but most people do not know." Here a reference is made to the general stability of the Earth's crust. It is known that at the early stages of the Earth's existence before its crust cooled down, the latter was unstable. The stability of the Earth's crust is not however strictly uniform, since there are zones where earthquakes intermittently occur. As to the barrier between the two seas, it is an image which signifies that the waters of the great rivers and the waters of the sea do not mix at the level of certain large estuaries. "(God is) the One Who made the earth docile to you. So walk upon its shoulders! Eat of His sustenance! Unto Him will be the Resurrection." "After that (God) spread the earth out. Therefrom He drew out its water and its pasture. And the mountains He has firmly fixed. Goods for you and for your cattle." In many such verses, emphasis is laid upon the importance of water and the practical consequences of its presence in the earth's soil, i.e. the fertility of the soil. There can be no doubt that in desert countries, water is the most important element governing man's survival. The reference in the Qur'an however goes beyond this geographical detail. According to scientific knowledge the character the Earth has of a planet that is rich in water is unique to the solar system, and this is exactly what is highlighted in the Qur'an. Without water, the Earth would be a dead planet like the Moon. The Qur'an gives first place to water among the natural phenomena of the Earth that it refers to. The water cycle is described with remarkable accuracy in the Qur'an. When the verses of the Qur'an concerning the role of water in man's existence are read in succession today. they all appear to us to express ideas that are quite obvious. The reason for this is simple: in our day and age, we all, to a lesser or greater extent, know about the water cycle in nature. If however, we consider the various concepts the ancients had on this subject, it becomes clear that the data in the Qur'an do not embody the mythical concepts current at the time of the Revelation which had been developed more according to philosophical speculation than observed phenomena. Although it was empirically possible to acquire on a modest scale, the useful practical knowledge necessary for the improvement of the irrigation, the concepts held on the water cycle in general would hardly be acceptable today. Thus it would have been easy to imagine that underground water could have come from the infiltration of precipitations in the soil. In ancient times however, this idea, held by Vitruvius Polio Marcus in Rome, 1st century B.C., was cited as an exception. For many centuries therefore (and the Qur'anic Revelation is situated during this period) man held totally inaccurate views on the water cycle. Two specialists on this subject, G. Gastany and B. Blavoux, in their entry in the Universalis Encyclopedia (Encyclopedia Universalis) under the heading Hydrogeology (Hydrogéologie), give an edifying history of this problem. "In the Seventh century B.C., Thales of Miletus held the theory whereby the waters of the oceans, under the effect of winds, were thrust towards the interior of the continents; so the water fell upon the earth and penetrated into the soil. Plato shared these views and thought that the return of the waters to the oceans was via a great abyss, the 'Tartarus'. This theory had many supporters until the Eighteenth century, one of whom was Descartes. Aristotle imagined that the water vapour from the soil condensed in cool mountain caverns and formed underground lakes that fed springs. He was followed by Seneca (1st Century A.D.) and many others, until 1877, among them O. Volger . . . The first clear formulation of the water cycle must be attributed to Bernard Palissy in 1580. he claimed that underground water came from rainwater infiltrating into the soil. This theory was confirmed by E. Mariotte and P. Perrault in the Seventeenth century. "We [ Whenever the pronoun 'We' appears in the verses of the text quoted here, it refers to God.] sent down from the sky blessed water whereby We caused to grow gardens, grains for harvest, tall palm-trees with their spathes, piled one above the other-sustenance for (Our) servants. Therewith We gave (new) life to a dead land. So will be the emergence (from the tombs)." "We sent down water from the sky in measure and lodged it in the ground. And We certainly are able to withdraw it. Therewith for you We gave rise to gardens of palm-trees and vineyards where for you are abundant fruits and of them you eat." "We sent forth the winds that fecundate. We cause the water to descend from the sky. We provide you with the water-you (could) not be the guardians of its reserves." "God is the One Who sends forth the winds which raised up the clouds. We drive them to a dead land. Therewith We revive the ground after its death. So will be the Resurrection." It should be noted how the style is descriptive in the first part of the verse, then passes without transition to a declaration from God. Such sudden changes in the form of the narration are very frequent in the Qur'an. "God is the One Who sends forth the winds which raised up the clouds. He spreads them in the sky as He wills and breaks them into fragments. Then thou seest raindrops issuing from within them. He makes them reach such of His servants as He wills. And they are rejoicing." "(God) is the One Who sends forth the winds like heralds of His Mercy. When they have carried the heavy-laden clouds, We drive them to a dead land. Then We cause water to descend and thereby bring forth fruits of every kind. Thus We will bring forth the dead. Maybe you will remember." "(God) is the One Who sends forth the winds like heralds of His Mercy. We cause pure water to descend in order to revive a dead land with it and to supply with drink the multitude of cattle and human beings We have created." ". . . In the provision that God sends down from the sky and thereby He revives the ground after its death and in the change (of direction) of winds, there are Signs for people who are wise." "(God) sends water down from the sky so that the rivers flow according to their measure. The torrent bears away an increasing foam." "Say. Do you see if your water were to be lost in the ground, who then can supply you with gushing water?" "Hast thou not seen that God sent water down from the sky and led it through sources into the ground? Then He caused sown fields of different colors to grow." "Therein We placed gardens of palm-trees and vineyards and We caused water springs to gush forth." "It was not until the Renaissance (between circa 1400 and 1600) that purely philosophical concepts gave way to research based on the objective observation of hydrologic phenomena. Leonardo da Vinci (1452-1519) rebelled against Aristotle's statements. Bernard Palissy, in his Wonderful discourse on the nature of waters and fountains both natural and artificial (Discours admirable de la nature des eaux et fontaines tant naturelles qu'artificielles (Paris, 1570)) gives a correct interpretation of the water cycle and especially of the way springs are fed by rainwater." This last statement is surely exactly what is mentioned in verse 21, sura 39 describing the way rainwater is conducted into sources in the ground. "Have you observed the water you drink? Do you bring it down from the rainclouds? Or do We? If it were Our will, We could make it salty. Then why are you not thankful?" This reference to the fact that God could have made fresh water salty is a way of expressing divine Omnipotence. Another means of reminding us of the same Omnipotence is the challenge to man to make rain fall from the clouds. In modern times however, technology has surely made it possible to create rain artificially. Can one therefore oppose the statement in the Qur'an to man's ability to produce precipitations? The answer is no, because it seems clear that one must take account of man's limitations in this field. M.A. Facy, an expert at the French Meteorological Office, wrote the following in the Universalis Encyclopedia (Encyclopedia Universalis) under the heading Precipitations (Precipitations): "It will never be possible to make rain fall from a cloud that does not have the suitable characteristics of a raincloud or one that has not yet reached the appropriate stage of evolution (maturity)". Man can never therefore hasten the precipitation process by technical means when the natural conditions for it are not present. If this were not the case, droughts would never occur in practice-which they obviously do. To have control over rain and fine weather still remains a dream therefore. Man cannot willfully break the established cycle that maintains the circulation of water in nature. This cycle may be outlined as follows, according to modern ideas on hydrology. The calories obtained from the Sun's rays cause the sea and those parts of the Earth's surface that are covered or soaked in water to evaporate. The water vapour that is given off rises into the atmosphere and, by condensation, forms into clouds. The winds then intervene and move the clouds thus formed over varying distances. The clouds can then either disperse without producing rain, or combine their mass with others to create even greater condensation, or they can fragment and produce rain at some stages in their evolution. When rain reaches the sea (70% of the Earth's surface is covered by seas), the cycle is soon repeated. When rain falls on the land, it may be absorbed by vegetation and thus aid the latter's growth; the vegetation in its turn gives off water and thus returns some water to the atmosphere. The rest, to a lesser or greater extent, infiltrates into the soil, whence it is either conducted through channels into the sea, or comes back to the Earth's surface. network through springs or resurgences. When one compares the modern data of hydrology to what is contained in the numerous verses of the Qur'an quoted in this paragraph, one has to admit that there is a remarkable degree of agreement between them. Whereas the above verses from the Qur'an have provided material for comparison between modern knowledge about the water cycle in nature, this is not the case for the seas. There is not a single statement in the Qur'an dealing with the seas which could be used for comparison with scientific data per se. This does not diminish the necessity of pointing out however that none of the statements in the Qur'an on the seas refers to the beliefs, myths or superstitions prevalent at the time of its Revelation. "(God) has made the ship subject to you, so that it runs upon the sea at His Command." "(God) is the One Who subjected the sea, so that you eat fresh meat from it and you extract from it ornaments which you wear. Thou seest the ships plowing the waves, so that you seek of His Bounty. Maybe, you will be thankful." "Hast thou seen that the ship runs upon the sea by the Grace of God, in order to show you His signs. Verily in this are Signs for all who are persevering and grateful." "His are the ships erected upon the sea like tokens." "A sign for them is that We bore their offspring in the loaded Ark. We have created for them similar (vessels) on which they ride. If We will, We drown them and there is no help and they will not be saved unless by Mercy from Us and as a gratification for a time." The reference here is quite clearly to the vessel bearing man upon the sea, just as, long ago, Noah and the other occupants of the vessel were carried in the Ark that enabled them to reach dry land. Another observed fact concerning the sea stands out, because of its unusual nature, from the verses of the Qur'an devoted to it: three verses refer to certain characteristics shared by great rivers when they flow out into the ocean. The phenomenon is well known and often seen whereby the immediate mixing of salty seawater and fresh riverwater does not occur. The Qur'an refers to this in the case of what is thought to be the estuary of the Tigris and Euphrates where they unite to form what one might call a 'sea' over 100 miles long, the Shatt Al Arab. At the inner parts of the gulf, the effect of the tides is to produce the welcome phenomenon of the reflux of fresh water to the interior of the dry land, thus ensuring adequate irrigation. To understand the text correctly, one has to know that the English word 'sea' conveys the general meaning of the Arabic word bahr which designates a large mass of water and is equally used for both the sea and the great rivers: the Nile, Tigris and Euphrates for example. "(God) is the One Who has let free the two seas, one is agreeable and sweet, the other salty and bitter. He placed a barrier between them, a partition that it is forbidden to pass." "The two seas are not alike. The water of one is agreeable, sweet, pleasant to drink. The other salty and bitter. You eat fresh meat from it and you extract from it ornaments which you wear." "He has loosed the two seas. They meet together. Between them there is a barrier which they do not transgress. Out of them come pearls and coral." In addition to the description of the main fact, these verses refer to what may be obtained from fresh water and seawater: fish, personal adornment, i.e. coral and pearls. With regard to the phenomenon whereby the river water does not mix with seawater at the estuary, one must understand that this is not peculiar to the Tigris and Euphrates; they are not mentioned by name in the text, but it is thought to refer to them. Rivers with a very large outflow, such as the Mississippi and the Yangtze, have the same peculiarity. the mixing of their fresh water with the salty water of the sea does not often occur until very far out at sea. The constitution of the Earth is highly complex. Today, it is possible to imagine it very roughly as being formed of a deep layer, at very high temperature, and especially of a central area where rocks are still in fusion, and of a surface layer, the Earth's crust which is solid and cold. The crust is very thin; its thickness is estimated in units of miles or units of ten miles at the most. The Earth's radius is however slightly over 3,750 miles, so that its crust does not represent (on average) one hundredth of the of the sphere's radius. It is upon this skin, as it were, that all geological phenomena have taken place. At the origin of these phenomena are folds that were to form the mountain ranges; their formation is called 'orogenesis' in geology. the process is of considerable importance because with the development of a relief that was to constitute a mountain, the Earth's crust was driven in proportionately far down: this process ensures a foundation in the layer that underlies it. The history of the distribution of the sea and land on the surface of the globe has only recently been established and is still very incomplete, even for the most recent and best known periods. It is likely that the oceans appeared and formed the hydrosphere circa half a billion years ago. The continents were probably a single mass at the end of the primary era, then subsequently broke apart. Some continents or parts of continents have moreover emerged through the formation of mountains in maritime zones (e.g. the North Atlantic continent and part of Europe). According to modern ideas, the dominating factor in the formation of the land that emerged was the development of mountain ranges. The evolution of the land, from the primary to the quaternary era, is classed according to 'orogenic phases' that are themselves grouped into 'cycles' of the same name since the formation of all mountains reliefs had repercussions on the balance between the sea and the continents. It made some parts of the land disappear and others emerge, and for hundreds of millions of years it has altered the surface distribution of the continents and oceans: the former at present only occupying three tenths of the surface of this planet. In this way it is possible to give a very rough outline of the transformations that have taken place over the last hundreds of millions of years. "For you God made the earth a carpet so that you travel along its roads and the paths of valleys." "The earth, We have spread it out. How excellently We did that." The carpet which has been spread out is the Earth's crust, a solidified shell on which we can live, since the globe's sub-strata are very hot, fluid and hostile to any form of life. The statements in the Qur'an referring to the mountains and the references to their stability subsequent to the phenomenon of the folds are very important. ". . . the mountains, how they have been pitched (like a tent). The Earth how it was made even." "Have We not made the earth an expanse and the mountains stakes." The stakes referred to are the ones used to anchor a tent in the ground (autad, plural of watad). Modern geologists describe the folds in the Earth as giving foundations to the mountains, and their dimensions go roughly one mile to roughly 10 miles. The stability of the Earth's crust results from the phenomenon of these folds. "And the mountains (God) has fixed them firmly." "(God) has cast into the ground (mountains) standing firm, so that it does not shake with you." "We have placed in the ground (mountains) standing firm so that it does not shake with them." These verses express the idea that the way the mountains are laid out ensures stability and is in complete agreement with geological data. In addition to certain statements specifically relating to the sky, examined in the preceding chapter, the Qur'an contains several passages dealing with the phenomena that occur in the atmosphere. As for the comparison between them and the data of modern science, it is to be noted here, as elsewhere, that there is absolutely no contradiction between today's modern scientific knowledge and the phenomena described. "Those whom God wills to guide, He opens their breast to Islam. Those whom He wills lose their way, He makes their breast narrow and constricted, as if they were climbing in the sky." Some commentators have claimed that the notion of discomfort at high altitude was unknown to the Arabs of Muhammad's time. It appears that this was not true at all: the existence on the Arabian Peninsula of peaks rising over two miles high makes it extremely implausible that they should not have known of the difficulty of breathing at high altitude. [ 1. The city of Sanaa, the capital of the Yemen, was inhabited in Muhammad's time. It lies at an altitude of nearly 7,900 feet above sea level.] Others have seen in this verse a prediction of the conquest of space, an opinion that appears to require categorical denial, at least for this passage. Electricity in the atmosphere and the consequences of this, i.e. "(God) is the One Who shows you the lightning, with fear and covetousness. He raised up the heavy clouds. The thunder glorifies His Praise and so do the angels for awe. He sends the thunder-bolt and strikes with them who He wills while they are disputing about God. He is All Mighty in His Power." "Hast thou not seen that God makes the clouds move gently, then joins them together, then makes them a heap. And thou seest raindrops issuing from within it. He sends down from the sky mountains of hail, He strikes therewith whom He wills and He turns it away from whom He wills. The flashing of its lightning almost snatches away the sight." In these two verses there is the expression of an obvious correlation between the formation of heavy rainclouds or clouds containing hail and the occurrence of lightning. the former, the subject of covetousness on account of the benefit it represents and the latter, the subject of fear, because when it falls, it is at the will of the All-Mighty. The connection between the two phenomena is verified by present-day knowledge of electricity in the atmosphere. "Out of the things He created, God has given you shade . . ."
"Have (the Unbelievers) not observed that for all the things God created, how their shadow shifts right and left, prostating themselves to God while they are full of humility." "Hast thou not seen how thy Lord has spread the shade. If He willed, He could have made it stationary. Moreover We made the sun its guide and We withdraw it towards Us easily." Apart from the phrases dealing with the humility before God of all the things He created, including their shadow, and the fact that God can take back all manifestations of His Power, as He wills, the text of the Qur'an refers to the relationship between the Sun and the shadows. One must bear in mind at this point the fact that, in Muhammad's day, it was believed that the way a shadow moved was governed by the movement of the sun from east to west. This principle was applied in the case of the sundial to measure the time between sunrise and sunset. In this instance, the Qur'an speaks of the phenomenon without referring to the explanation current at the time of the Revelation. It would have been readily accepted for many centuries by those who came after Muhammad. In the end however, it would have been shown to be inaccurate. The Qur'an only talks moreover of the function the sun has as an indicator of shadow. Evidently there is no contradiction between the way the Qur'an describes shadow and what we know of this phenomenon in modern times.